I'm not sure who the first person was to actually try this, but knowlege of the 2.6L G54B block being in the Mazda trucks has been documented for some time. We took this idea and with the help of forum members, verified the theory by comparing Mazda service manual drawings of several transmissions. We really weren't sure if there would be any suprises, but I just had to answer the question for good. After two incorrect bellhousings, I finally found a salvage company with the correct part. This page lists the info that I have gathered on using a Mazda Model R transmission on a wideblock Mitsubishi engine. The Mazda Model R transmission is a great option for use with wideblock engines. It is a perfect option for those swapping into an RX7s or B2600s. The transmission has been used in RX7s with over 500hp and can handle revs over 11,000rpm. While it will bolt up to a Mitsubishi block there are several important details to be looked into. The bellhousing we are using comes from the Mazda B2600. Only 2 years are known to have this specific bellhousing. 1987-88 (12/86-6/88). Many used parts dealers are also very confused about this part. I have even seen a 1988 transmission that was a manual, was a wideblock pattern, but was not the detachable bellhousing that we need. There is also the other 2.6L engine. This is known as the G6 or "MPV" engine. When ordering, be sure to get a photo sent to you before you purchase one of these. Specifying what side of the engine the starter is on helps too. There are several different Model R transmissions. The 2 most popular are the Mazda B2600 pickup and the Mazda RX7. The RX7's shifter possition sits 6" further back than the B2600. You may want to measure from the face of the bellhousing to the shifter hole in your car to determine which transmission to use. Below is a list of the different gear ratios. Most of the other differences are subtle, but are useful for identifying a transmission. Series 4 have a flat 2 bolt transmission bushing that connect the transmission. Series 5 have 2 angled spots and 4 bolts, as well as a differnet crossmember. B2600 Transmissions have the shifter mounted 6" forward of that of the RX7 transmissions. This is a very good shifter position for swaps into StarQuests, other wise you need to move the shifter back beyond the stock shifter hole. Some B2600 bellhousings use ten bolts to the gearbox, others use eight. 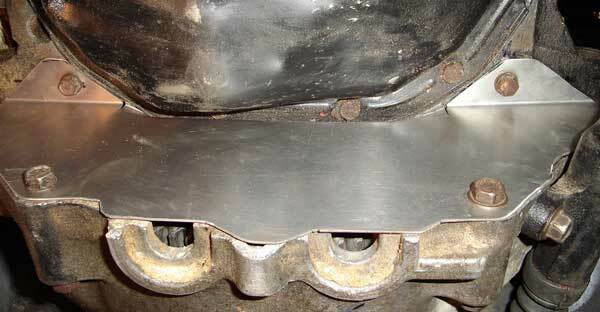 The bolt pattern is the same though and not having those 2 bolts will make little difference. Later Model R transmissions from Mazda B series trucks may not work. They have varying input shaft lengths which will not work with the 6 bolt flywheel. The Starion flywheel and clutch will work with the Model R transmission. Fidanza flywheels made for the Starion will work as well. 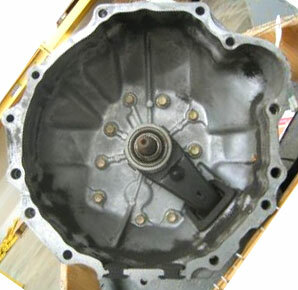 The RX7 flywheel will not bolt to the 4G6x crank and therefore cannot be used. The RX7 Turbo II (240mm) and Later Starion (240mm) Clutches are the same. If you search through ACT's catalog you will see that the pressure plates and disks are the same. Save a few dollars by buying an RX7 kit which comes with the correct throw out bearing. You will save enough to pay for the input bearing which you should be able to find at any auto parts store. 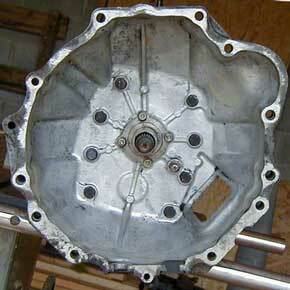 To protect the flywheel and clutch from stones, make a stone shield for the lower half of the bellhousing. This is a fairly easy part to make. Bend the top of a small piece of aluminum 90 degrees and trim to shape. You can hold it on with 2 bolts on the block and by through bolting several of the bolts on the lower half of the bellhousing. Dont skip this step or you'll end up with a bellhousing full of stones and maybe even a damaged clutch. There are many things to consider when putting any transmission into a chassis it never belonged in. I will point out the issues when intalling into a Starion, but these points should all be considered when doing any transmission swap. The result of this is that the plugs on the top of the driver side come close to the transmission tunnel. Nothing needs to be modified, but its an important point to remember. Importantly, even with this tilt of the transmission, the shifter still points straight up. In chassis where you will need to fabricate engine mounts, you may want to tilt the engine and leave the transmission pointing straight up like in this RX7. 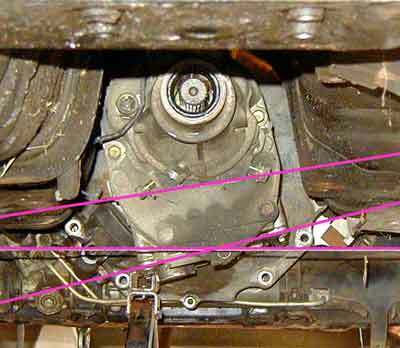 Due to the differences of the transmission castings for bushings, the actual design of the crossmember may differ between series 4 and 5 transmissions. I had a Series 5 so that is what I developed my crossmember for. I first mocked up the crossmember using wood blocks. This helped to eliminate the confusion of the tilt in the transmission while laying underneath the car. 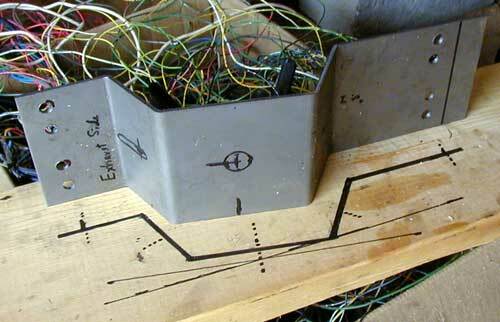 I then took the angle of the transmission from the photo taken above and used this to for my final drawing. 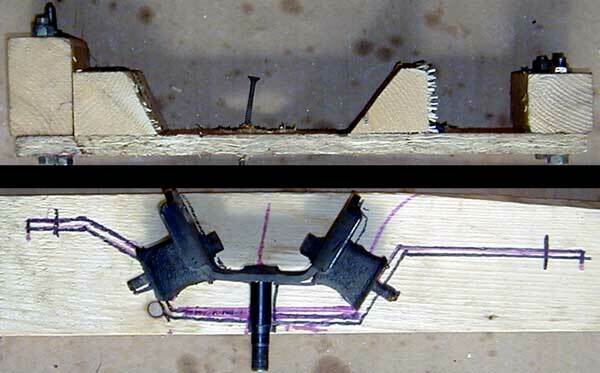 This angles from this drawing were used to bend a piece of metal which was then reinforced on the sides. I drilled and slotted some holes and bolted it all together! The end result is very strong, and retains alot of ground clearance. It retains the stock bushings to cut down on vibration and noise. The length from the block to the shifter is very important. This is what places the shifter where you can use it. This is VERY important as this is one of only 6 control mechanisms in the car. Using the stock fore/aft engine placement in a Starion, the RX7 shifter will be located about 6" behind the stock shifter location. Not good if you want to keep your center console. 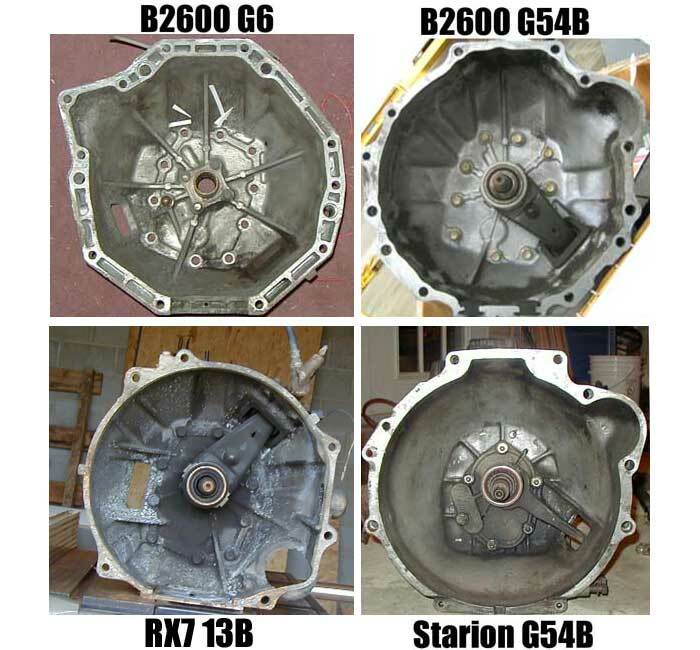 The B2600 transmission is the best choice in this situation, but if someone would like to move their engine forward, the RX7 transmission quickly becomes viable again. 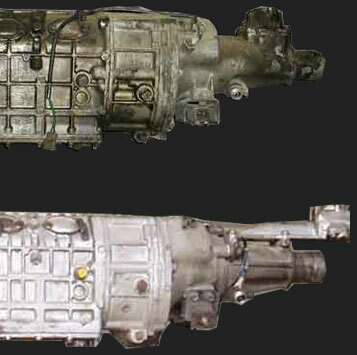 If you can find a full B2600 transmission it will be the best option. It has a different tail housing which places the shifter several inches forward of the RX7's. Below, the B2600 is on the top, the RX7 is on the bottom. People swapping into other chassis may want to measure first. It appears that the RX7 and B2600 use the same clutch fork. Pick one! The Starion has all the proper measurements to use it, but it will need to be drilled to use the B2600 slave cylinder's rod. The RX7 and B2600 throwout bearings are the same and either will work. The Starion one may work as well. Physically, the Starion speedometer cable threads right onto the RX7 transmission. There is likely a way to calculate this. There are different ratio speedometer senders available on several Mazda Models. More info can be found at the bottom of this great site: Solo Miata. Worst case is that you need to Photoshop some new gauge faces to put behind the speedometer so that it reads correctly. This is the least important gauge anyway :-D.
The RX7 transmission was geared for rotary engines which have a reputation for having no low end torque on a car with a 4.10:1 rear ratio. While it will be fine (and fuel efficient) to drive on with the Starion's 3.54:1 gears, the car might loose some of its zip. You'll have a 211mph 5th gear (at stock 7500rpm redline) you'll never be able to use. 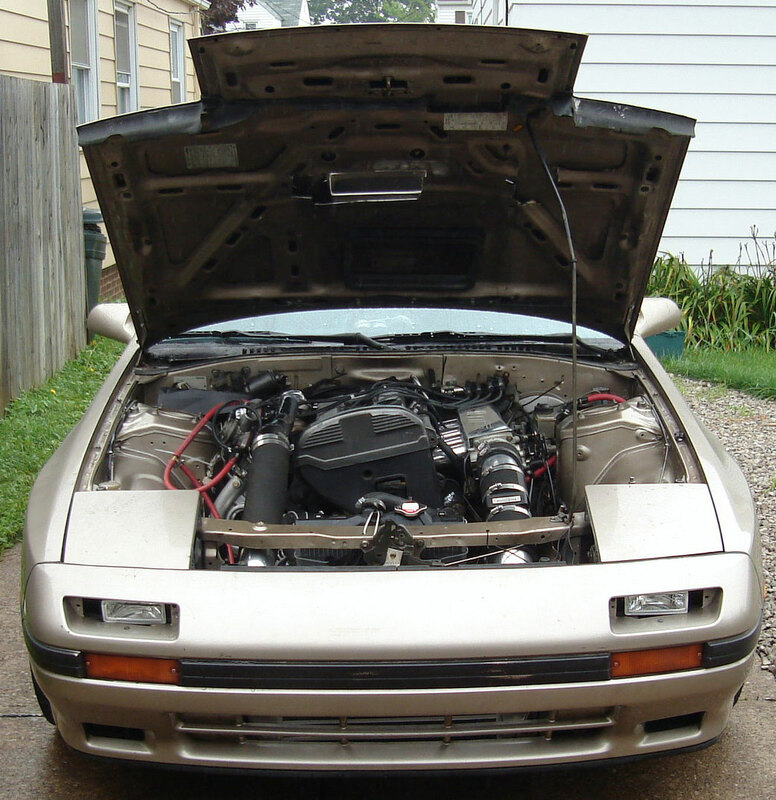 The Starion has several options, although none of them will be found in a Starion. The years and trim models have not been clearly defined yet. Sites like Car-Part.com can be used to see all of the options and what trim vehicles came with which ratios. You may want to verify tooth counts before purchasing to make sure you get the correct gearset. While I haven't made up my mind yet, I did create an MicroSoft Excel spreadsheet that can calculate wheel speeds based on inputs such as engine RPM, transmission gearing, tire diameter, and rear end ratios. Use this to see which performs best with the transmission, course conditions and powerband I will be using.